THPBlog: Sierra Pacific Industries to clearcut log near Eagle Lake. Sierra Pacific Industries to clearcut log near Eagle Lake. 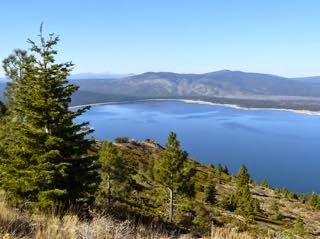 This THP is 7 miles north of Susanville, CA and within a few miles of the southern shore of Eagle Lake at an elevation of 5,400 to 6,900 feet. Sierra Pacific Industries is planning a clearcut and shelterwood removal tractor based logging operation in Jeffrey pine, ponderosa pine, sugar pine and white fir forests. There is a slide below an abandoned road near a class III (intermittent) watercourse in section 13, and a wet meadow in the vicinity of the aspen restoration units. 22 acres of thinning conifers around aspens (aspen restoration treatment) is planned, and 6,710 feet of new seasonal roads will be constructed. Ground based equipment is proposed for use on slopes under 50% grade to assist yoder (hydraulic loader with drum winch capable of partial suspension of logs) operations. The use and abandonment of a landing is proposed inside a class II (mid sized) watercourse, and a road is planned for use inside a watercourse in aspen restoration unit 3. 16 road drainage sites are planned for work including rocking, dip construction and culvert repair/replacement. There is an osprey nest located 2 miles NW of the THP area at Eagle Lake, and bald eagle nests are located at Eagle Lake (2 mi) and Round Valley Reservoir (1.5 mi) from the THP area. Greater Sandhill cranes were reported nearby at Papoose Meadow and Coleman Lake, and there is an historic (1981) goshawk nest located 1.5 miles north of the THP area. Susanville beardtongue was found in and adjacent to harvest units, and 3 populations of moonworts were found in aspen restoration units. More information is available on the THP Tracking Center website.